Use Webhooks to get Coassemble to notify your system when events happen in Coassemble - for example when a student completes a course. 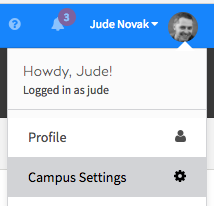 If Webhooks has been enabled on your campus, you can enable individual hooks in the settings section of Coassemble. To get started, head over to the Campus Settings page by clicking the link found in the main menu under your profile picture. Then select the 'Integrations' tab. Step 1: Add a Course Completed or Student Enrolled hook. 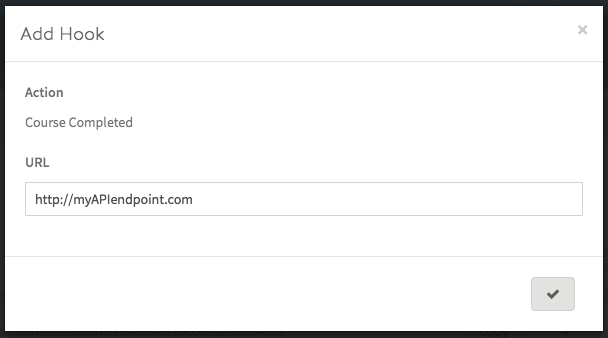 Step 2: Enter the URL of your API endpoint. Step 3: Click the test button to make sure the webhook works. It will receive a tick if the request received a successful response. You should of course check that your API has functioned properly as well. - If there is an error you will see a small x and you can hover over the button to see more details. Step 4: Enable the webhook. "title": "Customer Service - Hub"
Optionally, your API may return a JSON object with additional info. For a Course Completed webhook, you may return a return_url that the student will be directed to when they have completed the course. When the student has completed the course, they will see this message, which will take them to the return url, or back to the Coassemble dashboard if none is provided. You’ll want to determine that the request is genuine, and for that you can generate a secret token in the webhooks settings, and we will sign the header of the request with the hash of the request . You can use the secret token to confirm the authenticity of the request. An example of the request headers your webhook will receive - note the X-Hook-Signature header. To verify that the message is genuine, simply generate a SHA-256 HMAC of the request body, using the provided hook secret as the key, produce a hex digest, and compare it with the signature we provide in the X-Hook-Signature header.